From time to time, it may be necessary to void a posted Invoice in Acctivate. Often, it may be the case that the Invoice which needs to be voided has a related Payment record. The process of voiding the Invoice is easy enough (see our Void an Invoice help article). The process of voiding the related Payment can be a little more complicated. This article will discuss some methods for voiding the related Payment from Acctivate and QuickBooks. 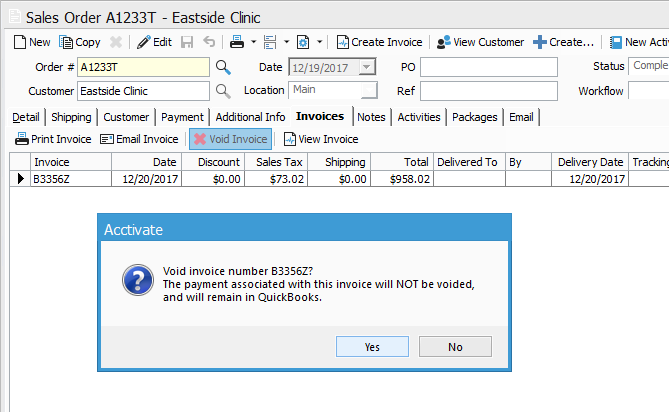 If the Invoice which is being voided has NOT been synced to QuickBooks, the user will get a message like the one seen below. In voiding the Invoice, the related Payment will also be voided, and neither will be created in QuickBooks until (if) the Invoice is re-released. 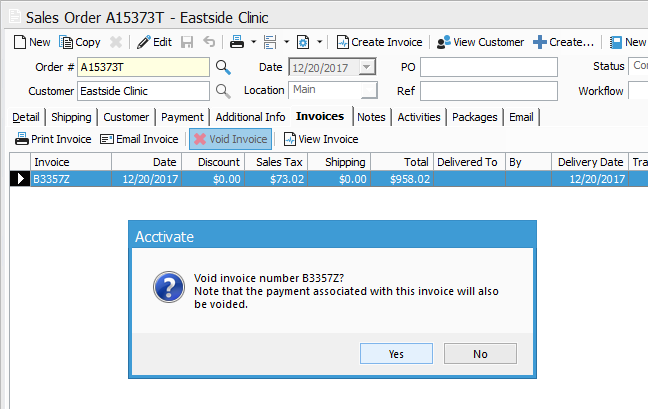 If the Invoice and Payment HAVE ALREADY synced into QuickBooks, the user will get a message like the one below, when voiding the Invoice. Because the Payment has already synced to QuickBooks, voiding the Invoice will NOT remove the Payment record from QuickBooks. NOTE: If the Invoice is re-released in Acctivate, the Payment will need to be re-applied by following the steps in this article. If the Invoice has been voided in Acctivate and the related Payment has already been synced to QuickBooks, then the Payment will need to be deleted from within QuickBooks. The first sync which is run after the Payment has been deleted from QuickBooks will remove the Payment from Acctivate. 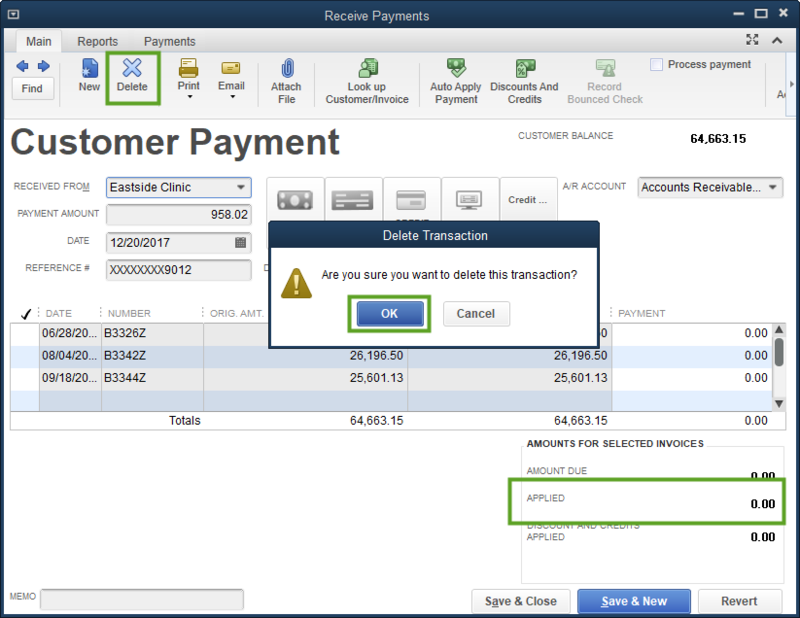 To do this within QuickBooks, first, open the Payment Transaction. Verify that the Payment is not applied to anything (as the Invoice should have been removed with the first sync after voiding in Acctivate), then click Delete and OK when asked if you’re sure you wish to Delete the Transaction. Then, run a sync. After the sync, the Payment should no longer show in either system. Once the Payment records have been removed from QuickBooks and Acctivate, check in your Credit Card Processor to verify that the related Charge has either been voided, deleted or refunded.